Thank you for being part of the Lifewater family! Together we have served more than two and a half million people with safe water and sanitation across 40 countries over the past 40 years. What’s truly transformational, though, is seeing the families we serve experience the love of Christ and turn to do likewise for their neighbors. On a recent trip to Cambodia, I met a woman named Phor Rom. With the help of the local Lifewater staff, she worked hard last year to build a latrine, keep her home clean, wash hands and use safe water. 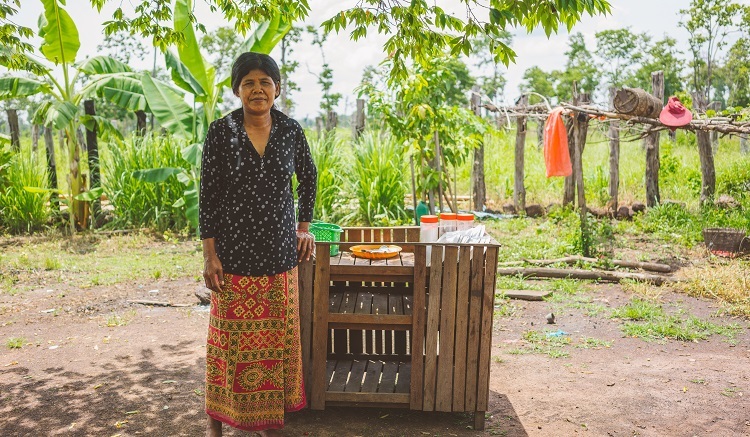 In December, she became one of the first Healthy Homes in her village. But her story didn’t stop there. Phor Rom is a Christian in a country where only 3.2% of the population follows Jesus. Moved by a call to love her neighbor, Phor is now helping 21 other families become healthy homes. In the process, two of her neighbors have accepted Christ. When we met with Phor last month, she asked us to pray for her. She said, “pray that even if I am persecuted, that I will still keep loving my neighbors.” As we laid hands on her, Phor’s neighbor ran up and asked us to come pray over her family as well. As a partner in the ministry, I know you are moved to see the world’s most vulnerable find hope, health and healing. Throughout this annual report you’ll find quotes and stories of transformation that demonstrate the true impact we can make when we all work together. Behind all the data, statistics and numbers are people like Phor Rom, moved by the love of Christ, bringing safe water, health, and the hope of Jesus to those around them. Thank you for your continued partnership with Lifewater!